Matrox’s three divisions – Matrox Graphics, Matrox Imaging and Matrox Video – provide an extensive array of real-world relevant OEM and end-user solutions to businesses and individuals across a diverse range of professional markets, including media and entertainment, finance, digital signage, medical imaging, manufacturing, factory automation, security, government, and enterprise computing. 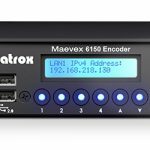 Maevex 6120 delivers simultaneous dual 4K capture, stream and record on a standard 1GB Ethernet network with capture and real-time encoding. 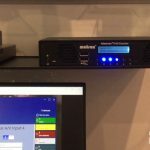 Matrox Maevex encoders, decoders & high-res streaming solutions ideal for integrators who need ‘major recording horsepower.” See their InfoComm 2018 booth. 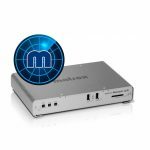 Matrox COTS X.mio5 network interface controller card with multichannel 4K, video processing and HDR clears path to IP broadcast workflows & no CPU usage. There are many ways to build video walls – and integrators should familiarize themselves with video wall displays options, says Samuel Recine of Matrox. Advantech, NEC and others round-out our list of the most innovative laser projectors, projection panels, video displays and more pro video products of 2017. 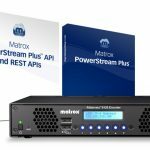 The Matrox Monarch HDX is one example of a product the company designed to help integrators fix common webcasting and streaming issues. Audio-Technica, Crestron, and others fill our list of the best streaming products, 4K video encoders, podcast mics, other content creation products of 2017.